Gigabyte Aivia Neon brilliantly combines the functionality of a wireless mouse with the versatility of a wireless presenter. It is the ultimate accessory for individuals needing an all-in-one product on the go. Elegant and effective from the classroom to the conference room, Aivia Neon is one product you don’t want to miss! Lifting the Aivia Neon off any surface will automatically activate air-mouse mode. 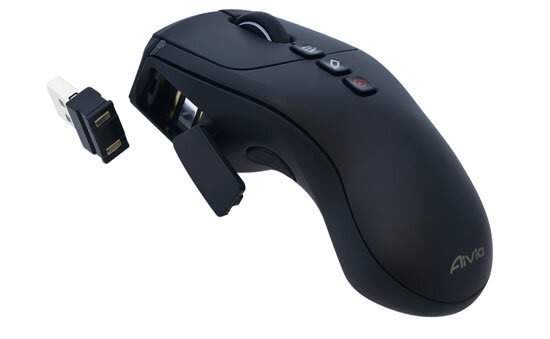 While in air-mouse mode pressing the air-mouse key will allow you to move the mouse cursor intuitively. Alternatively, double click the air-mouse key to keep the cursor active. Placing the mouse back on a surface will de-activate air-mouse mode. Gigabyte Aivia Neon is equipped with a high density Li-ion battery for long lasting continued use. Recharging the battery is quick and easy, simply open the battery cover and attach to the USB nano-receiver. An indicator light will start to blink to show that the battery is charging. Not only can the receiver be used for charging, it’s also portable without effort! Plug-and-play technology makes it effortless to use the mouse on different devices. Tiny nano receiver ensures great experience of traveling with your notebook all the time!